It’s not convenient to derive a complex transfer function for a complex control system, therefore, the transfer function of each element of a control system is represented by a block diagram and the concerned system mentioned in the block represents the transfer function of the element. This symbolic representation in short form gives a pictorial representation relating the output and the input of a control system based on cause and effect approach. Block diagram shown above. Here G1(s) and G2(s) represents the transfer function of the individual elements of a control system. The system given is a feedback system or can also be called a closed loop system. 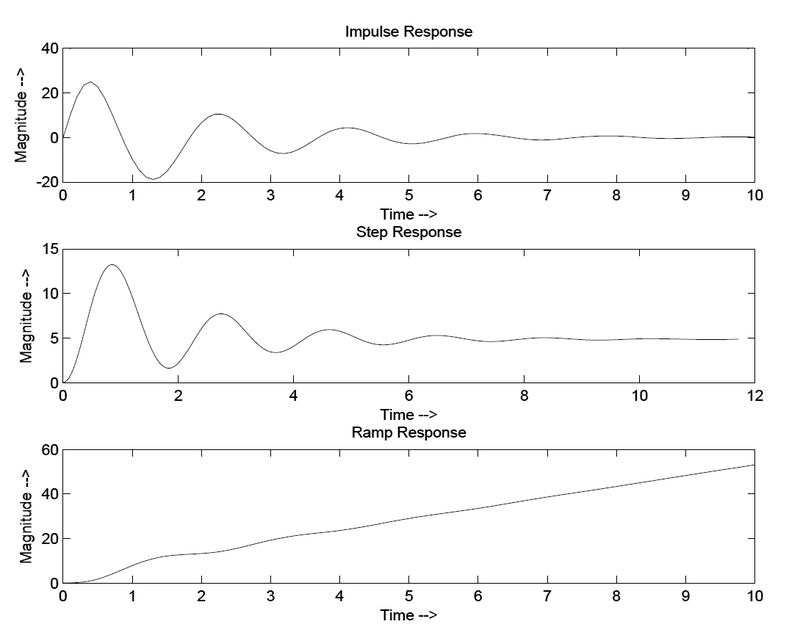 The output signal C(s) is fed back to be compared with the input R(s) , the difference E(s)=[R(s)– C(S)] is actuating signal or error signal. Problem: To reduce the given block diagram using sumblk and find impulse,step and ramp response. % Reduce the given Block Diagram using sumblk function. % Note: Now we are required to relate all these inputs and outputs. Why?? % matlab will be able to relate the transfer fuction with each other. % hence it is not included in the summing. This entry was posted in State Space Modelling and tagged Block Diagram, Block Diagram Reduction, Matlab Programming on November 29, 2013 by k10blogger.